Vegas can get hectic, good thing you've got the perfect chill-out spot. The giant lazy river lets you enter extreme relaxation mode. Challenge the kiddos to a game of pool, winner chooses dinner! Fully-equipped kitchens make feeding your crew a breeze. Need some me-time? The on-site spa will hook you up with island-inspired treatments. Private balconies make for the perfect private happy hour space. Jetted tubs let you chill out after a day of taking in the sights. Stay central to all of the excitement of the Las Vegas Strip while still having a peaceful crash pad to return to after an adventure-filled day by booking a suite at Tahiti Village Resort & Spa. Located just south of the Strip, this expansive island-inspired resort is a family-friendly oasis. One of its biggest draws is the epic pool area, so don’t be surprised if the kiddos are begging to go swimming the minute you arrive at your bright and spacious suite. Covering over an acre, the Tahitian-themed pool boasts a sandy beach area, seasonal tiki bar, volleyball net, four waterfalls and one of the longest lazy rivers in Las Vegas. Lounge poolside with the latest bestselling paperback, or leisurely float along the lazy river on an inner tube - tropical drink in-hand, of course. Treat yourself with an afternoon of pampering at the Mahana Spa; pick from a menu of rejuvenating massages, plus luxe add-ons like the Fijian scalp treatment or full body sugar scrub. When you and your crew are in the mood for some sightseeing (or some casino-hopping) complimentary shuttles will whisk you away to the Strip in minutes with stops at the Tropicana and Mirage casinos. If you’re visiting during the summer months, you’ll find an unforgettable show right onsite with Luau Sundays. Your crew will get to feast on a buffet of polynesian cuisine while enjoying traditional Pacific Islander entertainment, from Hawaiian hula dancing to Samoan fire-breathing! Each group-friendly suite at Tahiti Village is clean, spacious and well appointed to provide an island style oasis for your Vegas getaway. The one-bedroom boasts a full size kitchen, in-unit washer/dryer, and a steam shower and jetted tub in the bathroom. Bigger families and friend groups can enjoy all of these amenities, plus a smaller suite added on, in the two-bedroom, two-bath suite, which sleeps crews of up to eight. For a casual family meal or happy hour close to home head to the onsite restaurant 17° South Booze & Bites. Order from a crowd-pleasing menu of classic pub grub (nachos, burgers, wings) and tasty entrees, not to mention the wide array of craft beer and specialty cocktails. For an afternoon off-property check out the nearby Town Square, an open-air mall that will delight foodies and shopaholics alike. There’s even a playground and small hedge maze for the little ones. 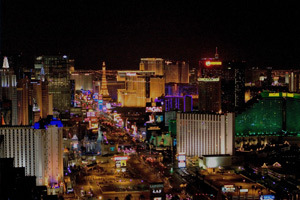 For a more quintessential Vegas experience have concierge help you out with ticketing to check out famous shows like Cirque du Soleil, Blue Man Group, or Celine Dion at the Colosseum.